She cries! 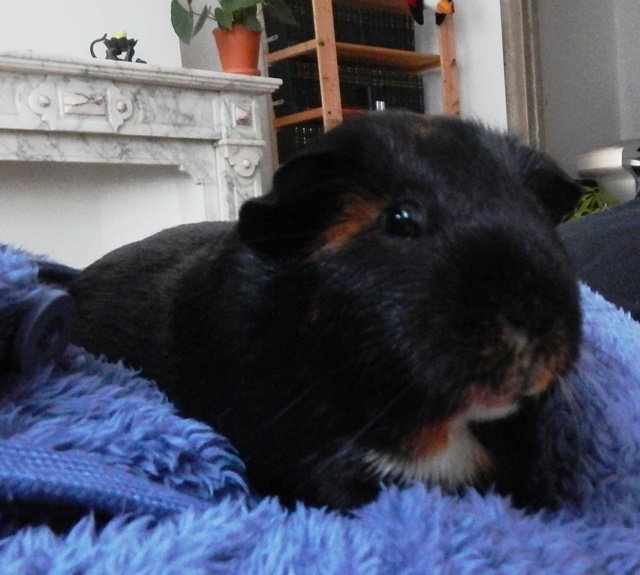 Holly mother of Guinea Pig Almighty God, that little bipod has lungs! I thought Worf’s cry for food is on the highest pitch I would ever hear, but I was proved wrong by a little human of 3 kilos and 50 cm. She is almost as big as two of us put together, but for sure she is louder. 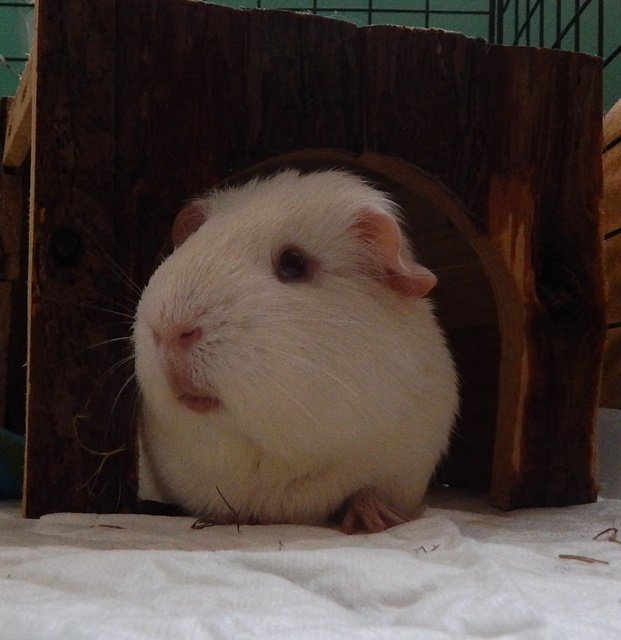 OK, I’ll slow down… So, as you may know, the couch is close to our penthouse from a very objective purpose: to keep an eye on humans and make sure they don’t forget feeding us. When the baby cries during the night the humans are bringing her on the couch so that her cries don’t wake up the neighbors. First time I heard her crying, I was literally petrified with fear. I run and hid so fast that even Spock was amazed. Not very flattering for a boar like me, but I must admit all this in case you will encounter the same issue: you need to be prepared, my friend! It gets better and better: she cries less during the night, I don’t get scared anymore. Anyhow, the good part is that in this way we’ve got the chance to see the hf. If not, she stays all day long in the bedroom feeding the baby and trying to put her to sleep. I hope things will get back on track, or at least close to our normality because I really miss the hf chasing me in my room to scratch me between ears. But we get to visit her in the bedroom from time to time. Apparently she can’t live without us. And now I’ll get to my point. I don’t understand how come a guinea pig pup is born fully functional and human baby needs years to get to the same stage! I’m saying all this in the broader context of them, the humans, believing to be the rulers of the world and us their pets. Come on, people! Ask yourself some questions: if we develop that fast and you are here to bring us food, who exactly rules the world?! Oh, by the way, since the hm took over the responsibility of cleaning our rooms and feeding us, we all got fatter. I and Spock not that much, but Kirk and Worf got around 50 grams each. The hf is shocked! What can you do if you have more than one boar and you want to keep them together?! First you need to understand that “fixing” us won’t help, so don’t put us through this procedure unless you want us paired with a female. Next, if we all grow up together and have enough space from the beginning, you may even not need to interfere. And when I say enough space I don’t mean a 1 x 0.6 m cage for two or more boars. I know this is what they usually sell in pet shops as rabbit cage, but trust me when I say it is too small for us. 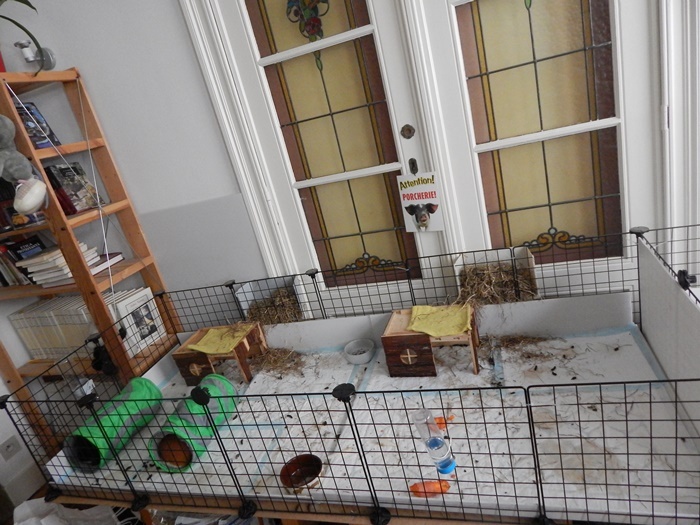 So, be prepared with space and for some handy work because you may even need to build us a spacious enough cage. But let me explain you with our own example. 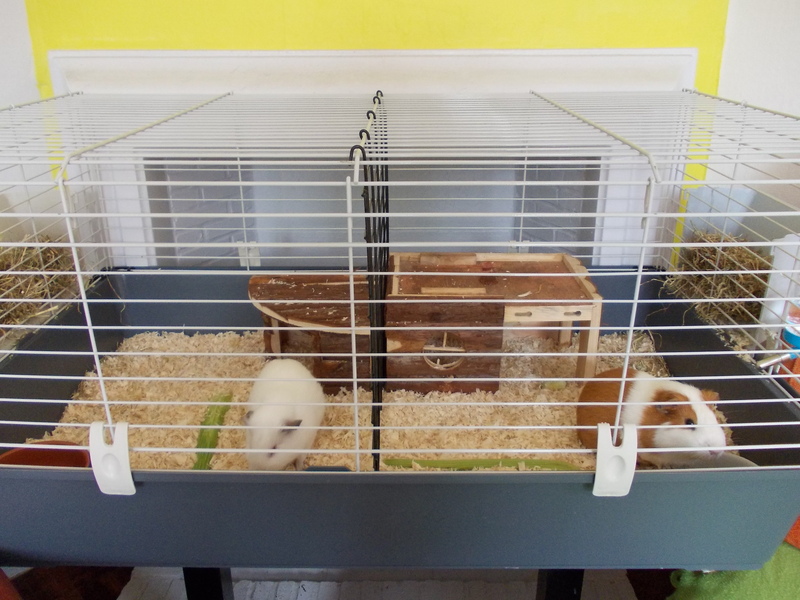 When I and Kirk arrived into our humans’ house, we were brought in a very small cage. And I mean really small, that we gave it away for a hamster after all. The guys in the pet shop said it was more than enough for us, but they knew nothing. Of course we were fine for few weeks, but then we’ve started again. And the end was that we were separated, each with our own 1 x 0.6 m cage. They were one next to each other and we could communicate easily. 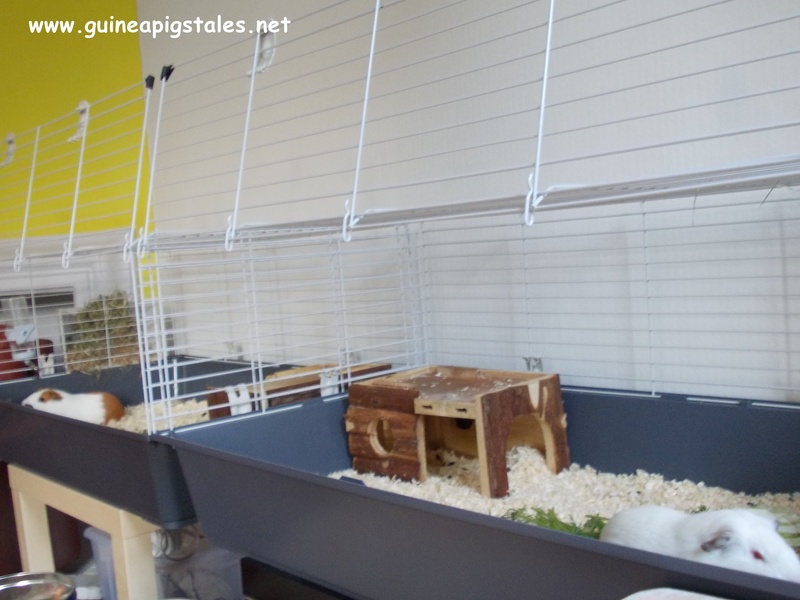 In August last year the humans moved in a bigger apartment where there was some space with few furniture pieces – the dinning and the kitchen. And the hf decided it was time to try and see if we were out of our puberty faze and maybe more willing to share rooms. After few trials it became obvious I got along just fine with Data, so starting September we are sharing a 2×4 C&C (1.4 x 0.7m). 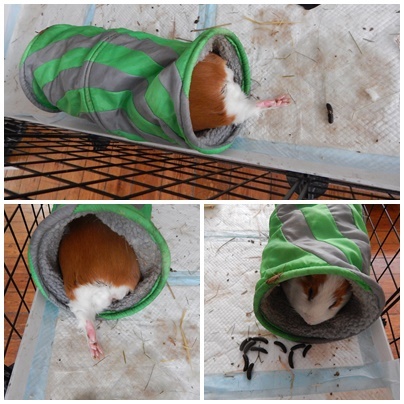 We still haven’t figured it out who’s the dominant one: even if I growl all the time, he takes over the tunnel… But I can’t stand to have him out of my sight and if the humans pick him up, he struggles to come back. So, after all, I think we are in to something. The humans are hoping that in some months, one year, we will all be able to live together in a big 2×9 C&C. I am sceptical as I know very well that I and Kirk can’t see eye to eye. 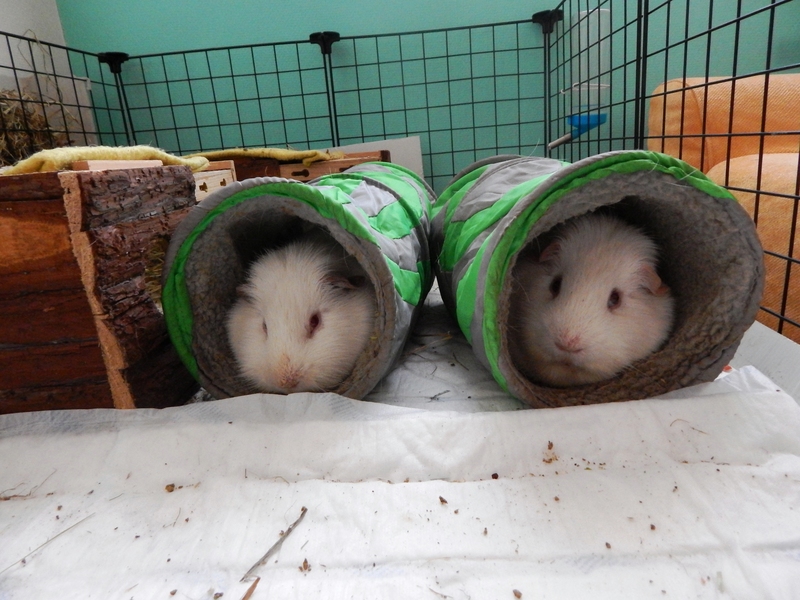 Piggies have different personalities, so matching us can be as difficult as matching people. Give us enough space and it may work. 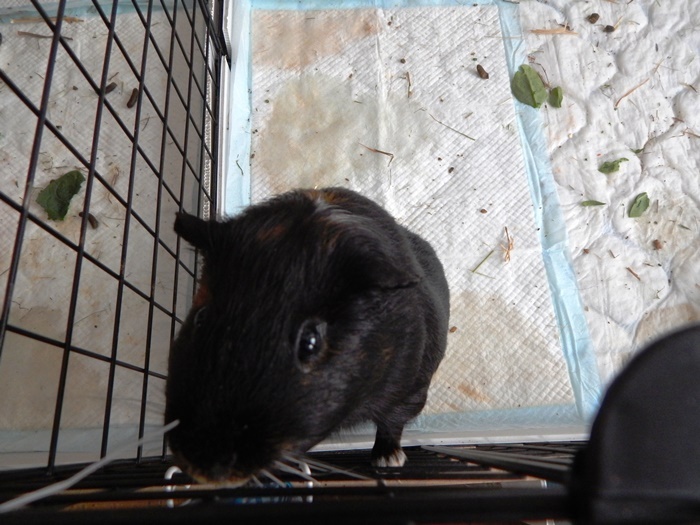 Give us food to distract in the first days, until we get used of having somebody else in the same cage. Unless we are really fighting and biting each other, don’t interfere. We need to prove and settle who the dominant is. But if you see signs of real aggressiveness, do not hesitate to separate us. The hf is at home waiting for a little biped to decide when she wants to be born. So she has a lot of time in her hands, a large part being dedicated to us. And she gets to do the groceries in slow motion… Today she went to the supermarket to buy veggies. Passing by the pet department, she took a look at the products for the guinea pigs hoping to find some nice treats but she was really disappointed. And she came home and told us all about it and made me decide to write about what we should be fed along with the hay and the veggies. So this is serious, again. In the beginning, Spock and Kirk were fed with the normal food that you find in the pet shops labelled as proper for guinea pigs. It was cheap, recommended by the guys working there and the human believed they knew their job. 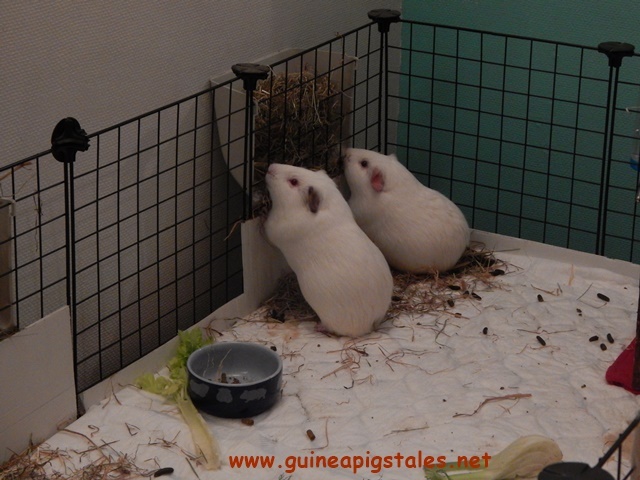 Moreover, from time to time they were getting some treats bought also from the pet shop – sticks with cereals. But something changed… Kirk’s weight, if you are wondering. 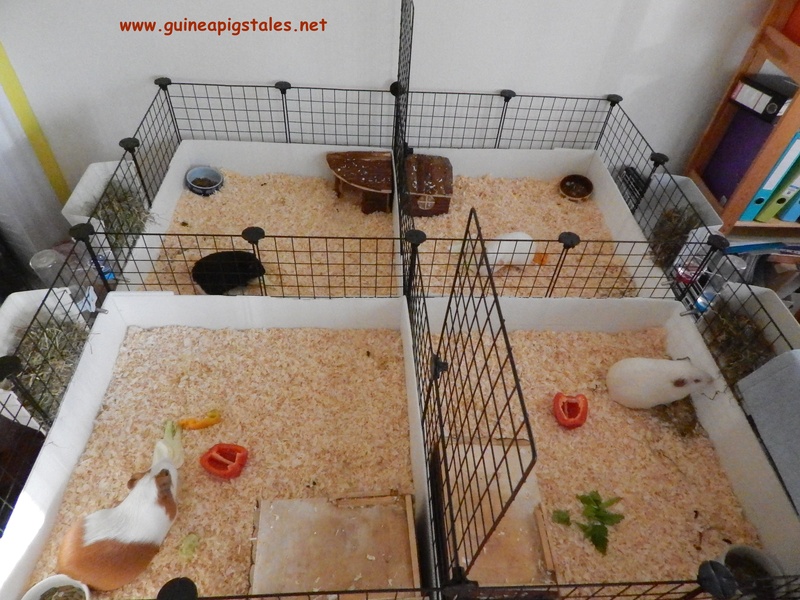 And the hf realized the pet shops couldn’t be trusted when it comes to good advice for raising the guinea pigs. A proper dry food for us should not contain cereals. Yes, they may be tasty; we can even have them from time to time, but not every day in considerable quantities. Why?! Because they get us fat. If you don’t believe me, ask Kirk! 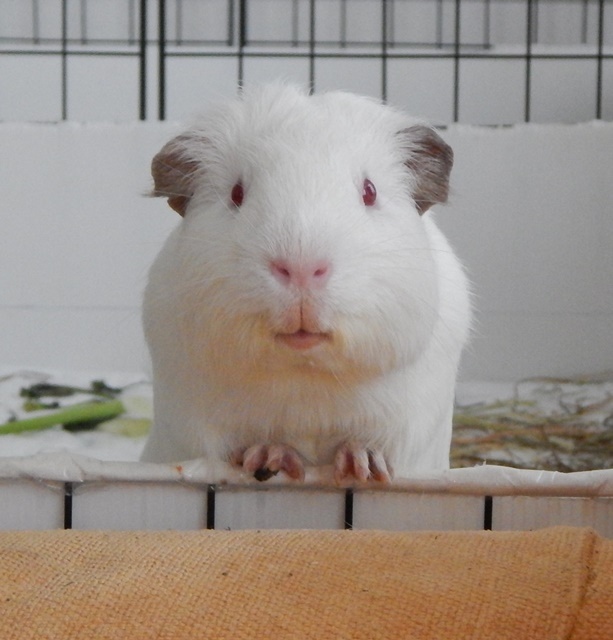 He is the reason why our hf started to search all over the Internet for some pellets that were more natural and suitable to some piggies than the ones found in the pet shops. The more processed is a food (you see the nice looking shapes that you can find in the dry food?! ), the further away is from it natural state. 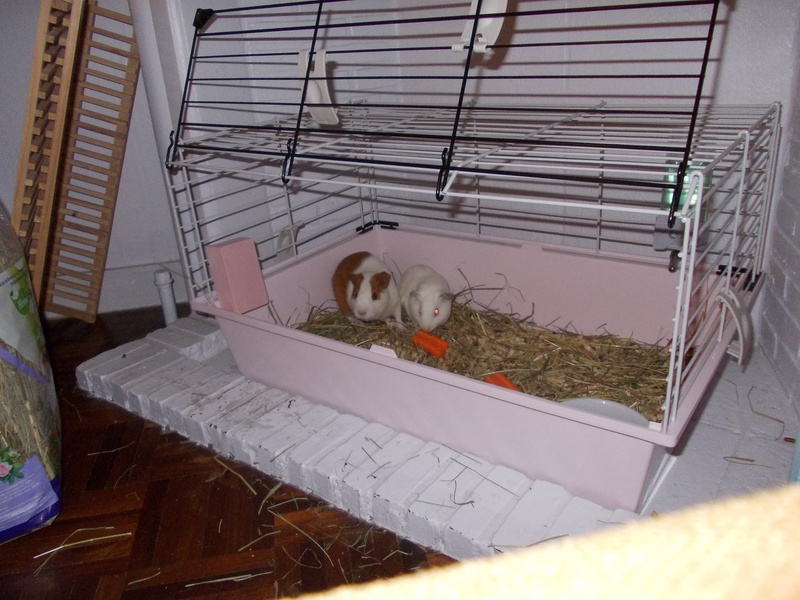 Now we are using “Versele-Laga Complete Cavia”, which has very little cereals and no sugar, is suitable for adult guinea pigs and contains also a supplement of vitamin C, among others. It is not perfect, but it’s what she found best in Belgium. Trust me, they are also tasty: I would eat a full bowl of them, but the hf is unyielding in her decision of giving us only around 30g/day. We only get more if we are celebrating something. The cereal bars were completely eliminated from our diet also. Not because of the cereals, but because of the large amount of sugar syrup used to stick them together. Any other unhealthy treats are out of question. Just Kirk gets to lick from time to time some chocolate leftovers from the hf’s fingers. The thing is we’ve got so used with a healthy diet that even when we get presents from other humans visiting, we don’t touch them if they are not healthy green stuff. That’s why the human friends prefer to bring us veggies and not to buy “trets” from the super market. Of course, we have a balanced veggie diet and we get plenty of hay which keeps us healthy and in shape. We also get to exercise: Data lives with Spock, who is very active and never lets the first one to rest for long, and I live now with Kirk and we have a huge room so we need to move around to get to the hay and the food. 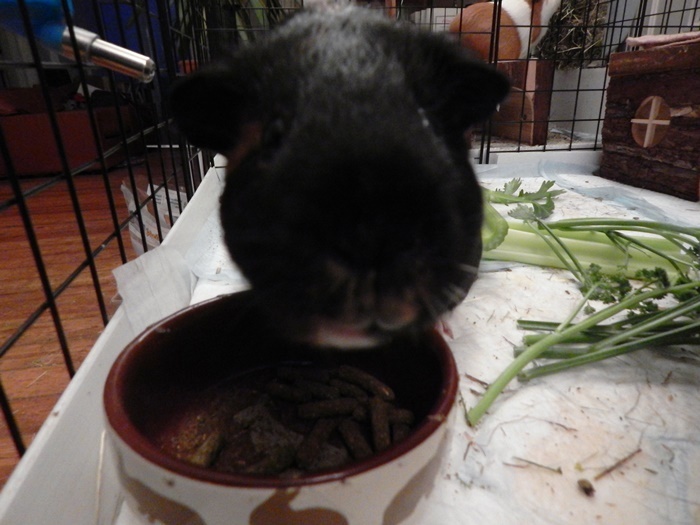 … and this is also me digging in the bowl.